When it's time to choose the right flooring for your home or business, know your options. For warmth and softness underfoot, carpet is your choice. Carpet has two components -- face pile and backing. Because the face pile (or yarn fibers) is subject to all the wear and tear, it's your key consideration. Backing is almost never seen once the carpet is installed, but it plays a role in the overall quality. Any carpet measuring more than 54 inches wide is referred to as "broadloom." Carpet face pile comes in two variations: cut and loop. In cut-pile carpets, individual yarns stand up straight from the backing. In loop-pile construction, the yarn comes out of the backing, loops over, and returns into the backing. Loop-pile carpets with a level surface are called level loops. If the loop height varies, the carpet is a multilevel loop. Most loop piles will perform better than cut piles over the long haul because the loops help evenly distribute the impact of foot traffic. One caveat: Loose loop-pile products, such as berbers, won't hold up as well under heavy traffic, especially if they are made with polypropylene, a less-resilient fiber. Cut-and-loop, or cut/uncut, carpets combine both pile types to add surface texture, and often blend multiple yarn colors. Sometimes referred to as "sculptured," these multitexture, multicolor carpets hide footprints and soil well. Generally, the heavier the carpet, the better it will hold up. However, don't select a product based on weight alone. Consider the carpet's density, pile height, and fiber type when comparing different varieties. Many carpets come in good, better, and best choices. These will be similar styles available in the same colors. The difference is usually weight. A retailer might offer a textured saxony in 28, 34, and 40 ounces, for example. If you're budget-conscious, select the heavier product for high-traffic areas and the lower-weight carpet for less-used rooms. Hardwood lasts longer than other flooring options and can be refinished several times (solid hardwoods can be refinished an unlimited number of times) -- or even restained to change their appearance. Today's polyurethane finishes allow installation in kitchens and half baths, as long as you take precautions to minimize water spills. Engineered woods are considered more stable for kitchen and bath applications. Wood flooring is available in strips, planks, and parquet squares. Unfinished flooring gives you almost unlimited color stain options. The drawback: Unfinished flooring must be sanded and finished after installation, which typically requires the expertise of a professional and puts the room out of service for several days. Prefinished flooring features a factory-applied finish that remodelers sometimes favor because it eliminates sawdust and finish vapors, and the room can be used within 24 hours after installation. The color options for prefinished flooring are not as varied as for unfinished flooring. Solid or engineered flooring consists of two or more layers of wood, similar to plywood. The top layer consists of a hardwood veneer, while the lower layers are typically softwood. Unlike engineered wood flooring, the most familiar wood flooring is comprised of solid one-piece boards. Most solid flooring is unfinished, while most engineered flooring is prefinished. Laminate flooring features a decorative image printed on one or more thin sheets of paper or other fibrous material. For durability, the decorative layer is impregnated with a plastic or resin, bonded to a rigid core, and then a backing material is added to prevent warping. The most popular location for laminate is in the kitchen; family rooms, foyers, and dining rooms are runners-up. Because the image printed on the paper layer is actually a photograph, laminate floors truly look like wood, stone, or other materials and come in a range of colors and patterns. Laminates sometimes sound hollow when they're walked upon. To solve the problem, some manufacturers offer underlayments that help deaden sound. Ceramic tile is suitable for use anywhere you want a durable, low-maintenance floor. This is especially true of moisture-prone, heavy-traffic areas such as bathrooms, mudrooms, entryways, and kitchens. 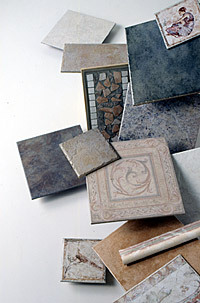 Ceramic tiles come in almost unlimited colors, patterns, shapes, and sizes. Ceramic tile falls into four basic categories: quarry tile, paver tile, patio tile, and glazed tile. The body of a tile, sometimes called the bisque or biscuit, is produced to meet a specific need or use. Although thickness is one gauge of strength, composition of the tile and the temperature and duration of firing also determine its strength. Vinyl floor coverings are durable and suitable for any room in the house. You'll find vinyl available as sheets or tiles in two categories. Sheet vinyl is a popular choice for bathrooms, kitchens, laundry rooms, entryways, hallways, and rec rooms. It comes in many patterns and styles. Vinyl tiles can be used in many of the same applications; however, dirt-collecting seams can make a vinyl tile floor difficult to keep clean. And the same joints can allow liquid spills to filter between tiles, loosen them, and damage the subfloor. Cleanability. For easy-care flooring, choose vinyl, laminate, or ceramic tile -- smooth surfaces that clean up with a sweep and a rag. Other materials will require a bit more upkeep to maintain their good looks. Durability. With the ability to endure an onslaught of abuse from children, pets, and heavy traffic, ceramic and stone tile, laminate, and concrete rank at the top. Although marks will show on hardwood, the surface can be refinished. Longevity. Standing the test of time are stone and ceramic tiles, hardwood, cork, and concrete. Most other flooring materials will eventually need replacing. Moisture resistance. For rooms prone to highly humid conditions, such as kitchens and baths, use materials that are more water-resistant, such as tile, vinyl, and certain types of laminate (check manufacturers' warranties). Allergens. If you're particularly sensitive and concerned about your home's indoor air quality, choose a hard flooring material, such as ceramic tile or hardwood, that contains few crevices or grooves to harbor dust mites and allergens.